Home » arizona , barack obama , cult of personality , cultural rot , gabrielle giffords , jared loughner , politics , tuscon » T-shirts at the Tuscon memorial service? T-shirts at the Tuscon memorial service? Does anyone else think that this was crass at best and beyond pale at worst? 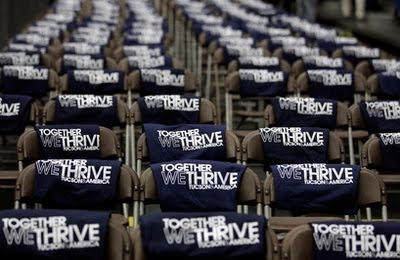 To the left you will see a few of the 20,000-some "Together We Thrive" t-shirts that were given away free as "souvenirs" - and that's being more charitable than it deserves to be called - at last night's memorial service for victims of this past week's massacre in Tuscon. I didn't watch it on television but a number of people whose reports I have long come to trust have shared a common sentiment: that last night's event was a meandering mess of narcissistic narcolepsy... with President Barack Obama as the focal point. Free t-shirts for attending a memorial service supposedly held in honor of those who died in an act of violence. I defy anyone to articulate how this was at all appropriate. You didn't see the people cheering and whopping and yelling. The crowd was like they were there to watch pro wrestling and not honor the departed. Also the Indian medicine man had no reason to be there. I didn't understand what he was talking about. It was a political rally for Obama. And that's all it was. Obama never letting a crisis go to waste. I only caught the last 15 minutes or so, but that was enough. Glorification of the state with standing ovations after every remark. It was sickening.
" 19 People Shot, 6 Dead, And All I Got Was This Lousy T-Shirt "
Way to stay classy, Obama.